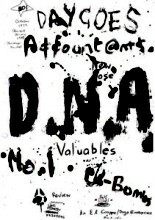 DNA - ZineWiki - the history and culture of zines, independent media and the small press. DNA (Adelaide, S.A.: E.C. Productions, 1979-) written by Harry Butler, is the longest running fanzine in Australia, running to ~120 issues, primarily covering Adelaide's punk, alternative and underground music scene. Over the years many other non-Adelaide bands have featured, often including detailed listings of lineups, recording sessions and releases for selected artists, plus sordid local gossip and occasional bad jokes. Live reviews come with complete set lists of songs performed. No pictures, just lots of typed out words, and very messy looking covers. This publication is more concerned with its contents than its appearance. This page was last modified on 10 November 2007, at 00:55.